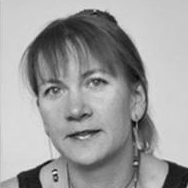 Irena Praitis is an associate professor of Literature and Creative Writing at California State University, Fullerton. She earned her PhD and MFA degrees from Arizona State University. In the spring of 2005, she was a Fulbright Scholar in Vilnius, Lithuania. Her poems, essays, translations, and reviews have appeared or are forthcoming in journals such as Rattle, Mochila Review, Mid-America Poetry Review, International Poetry Review, Cold Mountain Review, The Iconoclast, The Connecticut River Review, and Interculturidd & Traduccin. Her collection of poems, Touch, was published by Finishing Line Press in 2004, and her collection of poems, Branches, was published by D-N.
(In California, this is not as easy as it sounds). no matter how appealing that level space appears. or ruins, and stairs lead nowhere but to an empty up? Even firm foundations aren't always enough. and left the footprint of that knowledge. scuffs of circumstance constellate on my floor. the kitchen, what will they use?